The Greatest Catch of Their Life………. It was on their last drift south of the curl, it was their first drift without catching bottom when Gary hooked onto something. For the next 25 min or so Gary was reeling up something he has never experienced before. As his catch was getting closer to the surface he realized he didn’t have a gaff but he did have 2 experienced fishing buddies by his side Scott and Paul. 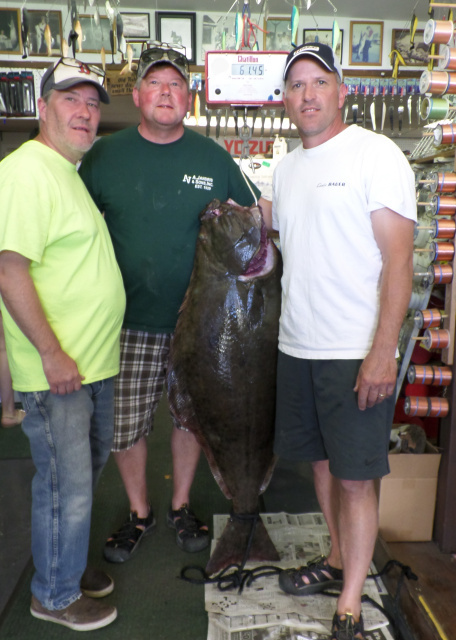 When his catch surfaced they couldn’t believe their eyes when they saw this monster HALIBUT!!!! Together they wrangled the beast HALIBUT onto their yellow sea swirl boat. They were screaming and high fiving each other like they just won the lottery. It was amazing to see this 62lb Halibut aboard their vessel. They attributed their lucky catch to the tasty clams from Bridge Road Bait and Tackle. This is the 2nd Halibut Bridge Road Bait and Tackle has checked in their official weigh station in their 23 years assisting Anglers in the Merrimack River Fishing Community. Sign Up Today for our current Fishing Reports and to be notified of discounts in store and online shopping.